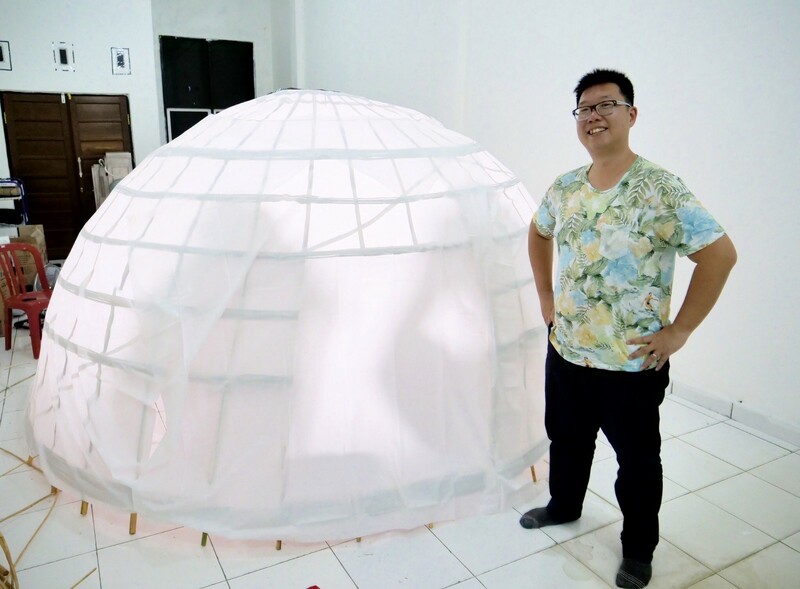 Standing next to Little Nest (Sarang Kecil), a prototype rural haze shelter to be built in village housing. Designed by Wally Tham to be built with locally sourced rattan and bamboo. Located in Palangka Raya, NestHQ (Sarang) : The first Haze shelter in Indonesia with 2 stages of active air filtration, capable of reducing PM2.5 particles by 95–99%. A converted shop space of 2000 sq feet, it’s up and running with capacity for 40 adults or 60 children. 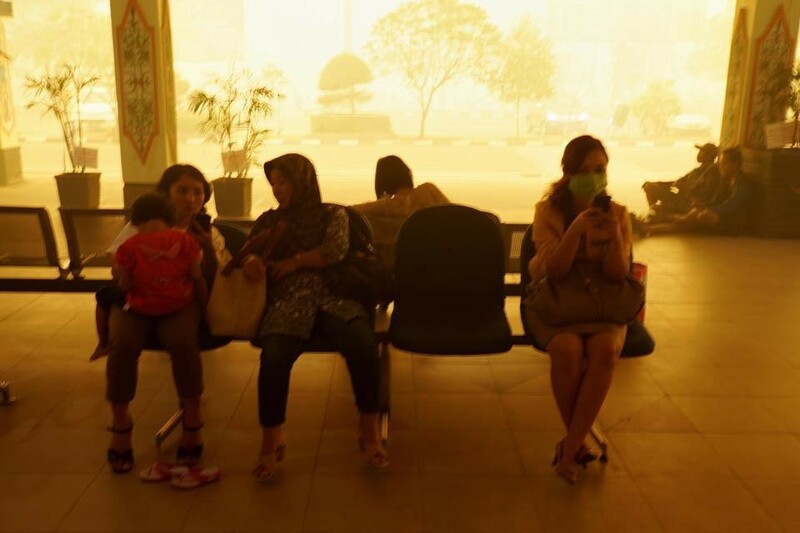 Two years in the making and after extensive R&D, we have Indonesia’s first haze shelter. 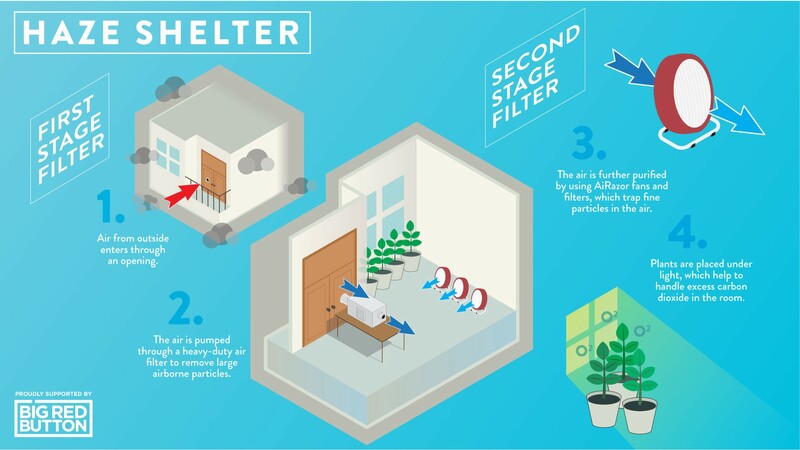 Based on my experience in extreme PM2.5 conditions, we have built airflow restricted entry ways, 1st stage filtration to draw 70–90% filtered oxygenated air in & have 6 Airazor purifiers to handle the the remaining fine particles. Little Nest(Sarang Kecil): Our advanced haze shelter prototype for rural village (wooden-board type) housing. By weight, Little Nest’s structure is made from 99% sustainable materials: readily available rattan or bamboo. It was designed to be simple for any village resident to build. We made the shell from IKEA shower curtains, sealing out pollution. Finally, a fan and filter membrane is fit on top to create a positive clean air pressure downwards, driving heat, CO2 and humidity out the bottom gaps. The Little Nest was built in response to UNICEF’s interest in our large haze shelter and the ongoing challenge of protecting village residents. Village houses (kampungs) are typically made from wooden boards and zinc roofs, are extremely difficult to seal. 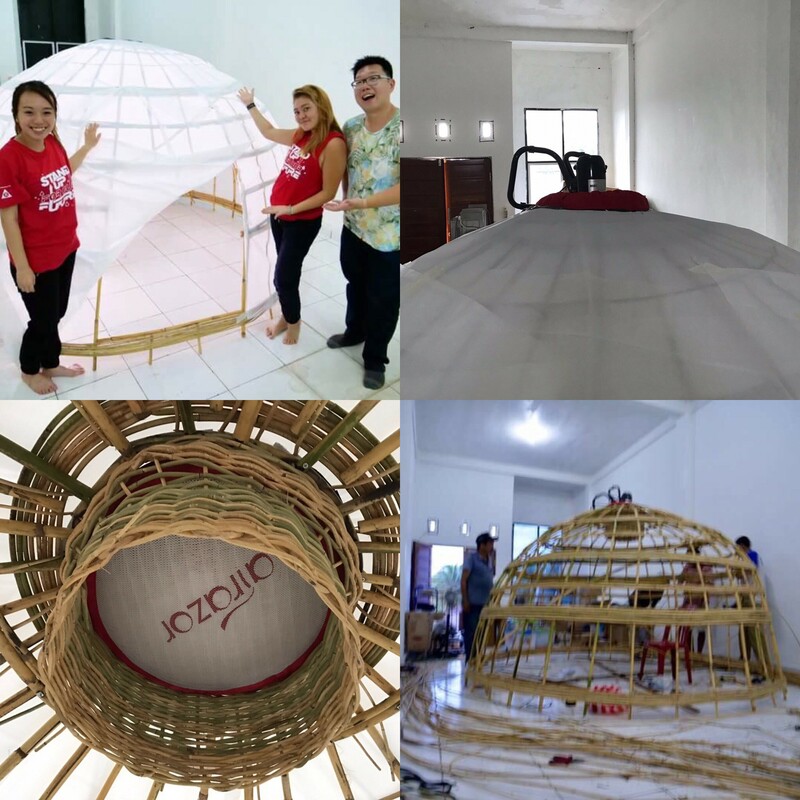 We decided to join in on UNICEF’s co-design campaign and within a week the Big Red Button team did our sketch-ups, sourced readily available materials and Ranu Welum found local craftsmen to build the rattan structure. The build took only a day and we are confident in creating a production line to scale the effort in the event of a haze emergency. The filter we use has a flow rate of 1.8m/second and can achieve over 15 air changes per hour. Schematic of The Nest Haze Shelter designed and built by Wally Tham. With capacity for 40 adults. Sealed and over pressured to keep pollution out and draw filtered oxygenated air in. The first Nest is up and running in Palangka Raya. The shelters were designed and funded by Wally Tham, founder of Big Red Button and built for our partners Ranu Welum, a youth led advocacy for the Dayak indigenous peoples. We believe these designs will help communities vulnerable to peatland fires. And share this story with your friends on Facebook or via email. Within a week of our sketch, we have the first prototype for Little Nest, our design addresses the challenges of sealing village houses that were built for ventilation in mind. These houses have numerous gaps to promote airflow, great for heat management but potentially deadly during peatland fires as airflow brings with it gases and pollutants. 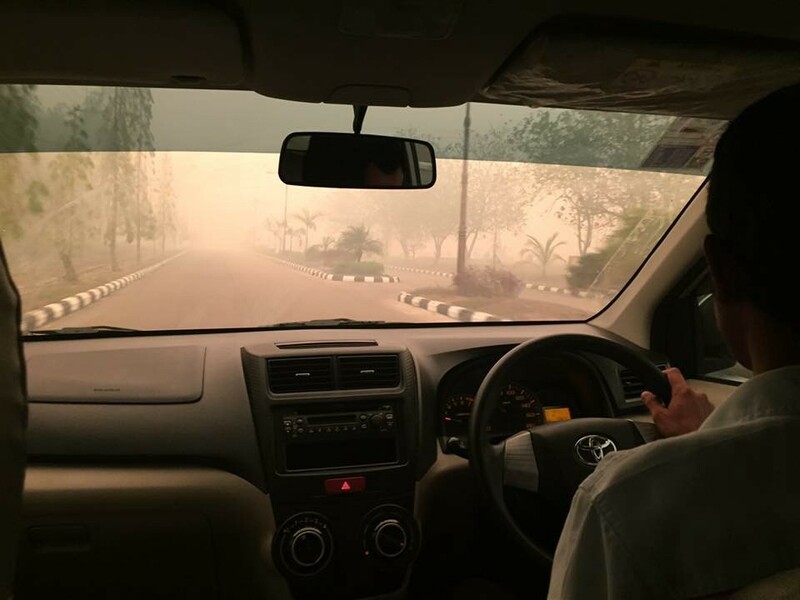 In 2015, Indonesia saw it’s biggest season of forest fires in years. The fires that spanned thousands of acres, put more carbon into the air in those 3 months than all of Europe does in a year. Pollution levels during my 6 day visit ranged from 35,000 PM 2.5/cubic feet to 1.7 million PM 2.5/cubic feet on any given day. 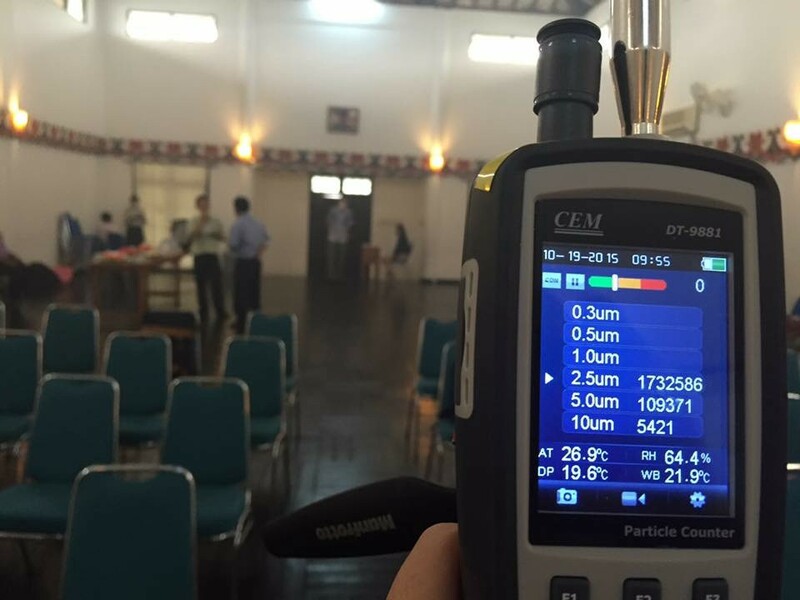 A “Good” rating is from 0–50 Pm 2.5/meter3. During the 2015 haze, I joined some Singaporeans in distributing mask to the people of Kalimantan. 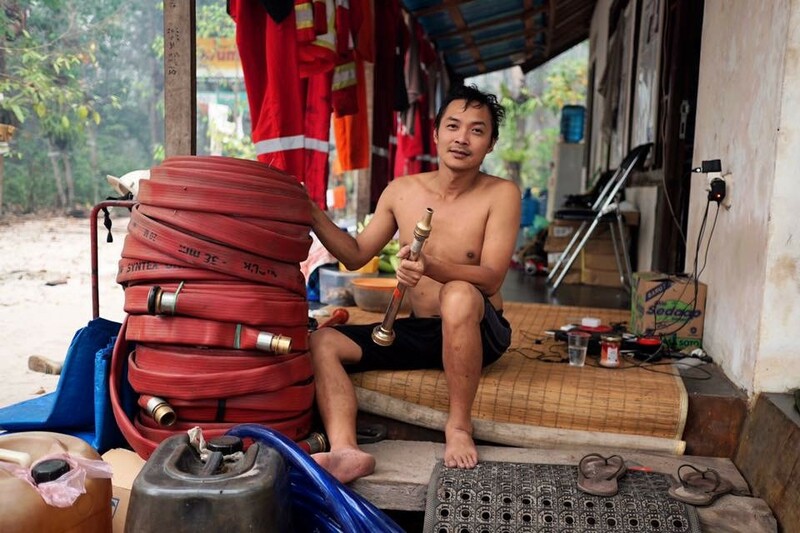 In the 6 days I was there I also crowdfunded a drone and professional masks for volunteer fire fighters. The drone was used to document the extent of the devastation and the photos made their way into news media, bolstering support for these brave men and women who charged into hellish conditions everyday. 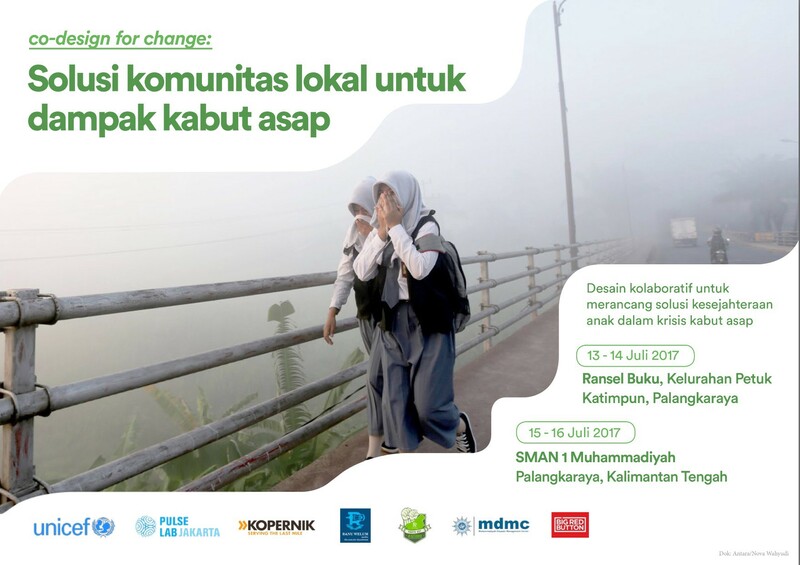 - crowdfunded a professional air quality meter for Ranu Welum, a young group seeking to protect the citizens of Kalimantan from the haze. - designed a workshop around explaining the effects of PM2.5 exposure and showed how N95 masks were effective via live data. Since October 2015, we have returned over 6 times to give media & leadership training to Ranu Welum. We funded the space and designed the systems for the Haze Shelter. We are passionately looking for partners to establish more clean rooms in Indonesia to protect children and the elderly should the fires appear again. With global warming drying peatlands, we know even the best intentioned governments may find fire suppression a challenge in the coming years. Smoke is comprised of mainly two parts, gases and particles. Particles can vary in size but the World Health Organization pays attention to Particulate Matter sized 2.5 microns (PM 2.5) because of their small size and ability to be absorbed into the body. For scale, the width of the human hair is 40 times thicker than a PM 2.5 particle. These particles can enter the body through the lungs, skin and eyes. When they accumulate in the body, over time the chances of stroke, cancer and heart disease increase dramatically. WHY DOES BIG RED BUTTON CARE? 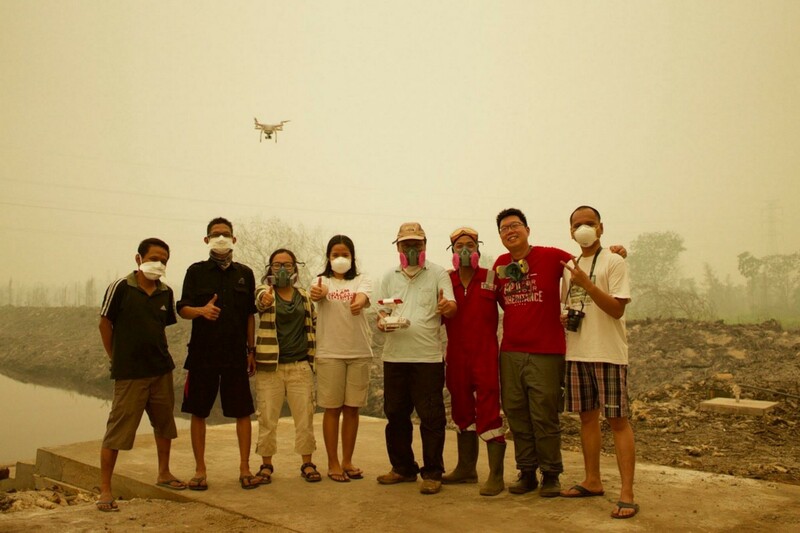 WWW.BIGREDBUTTON.COM.SG has been looking at the haze issue since 2013, creating PSAs and crowdfunding air purifiers in SIngapore for the elderly. 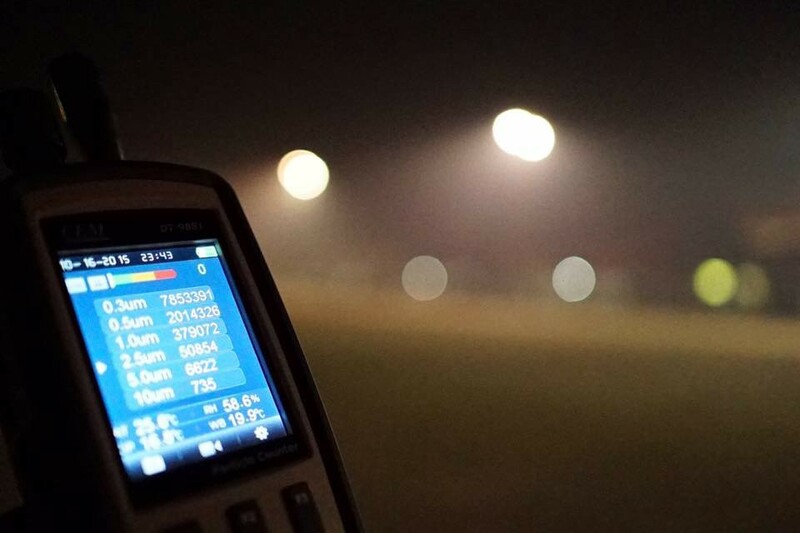 During the 2015 haze, Singapore saw spikes in PSI readings at over 400 points. Through our ground up initiative www.facebook.com/standupforSG , we crowdfunded 40 air purifier units for the elderly in low income housing. 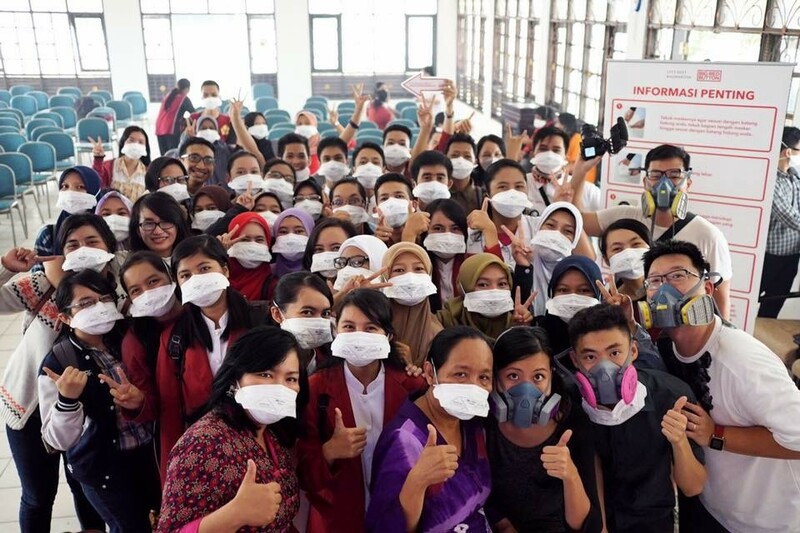 We then looked at how else we could help and were directed to the work of ‘Let’s Help Kalimantan’, we helped them make a crowdfund video and went on their 2nd trip to distribute masks. 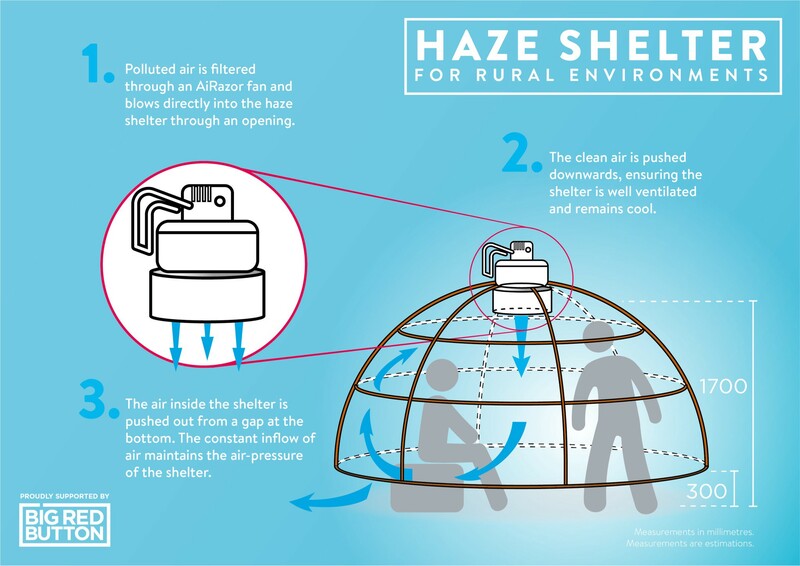 The haze shelter is the result of two years of follow up R&D and personal funding. We hope the designs will be used by all to create safe spaces for all.